"Made from heavy duty canvas (to withstand chewers) and has a skid-free base." "Has three layers of plush, therapeutic foam and a microfiber cloth." "Premium high-loft fill is ideal for pups that like to nestle into bed." "Has 4" of solid memory foam plus bolsters for added support." "A solid choice for all breeds and ages of dogs." "Designed like a bowl to keep your small friend warm and snug." "Elevated bed allows for air to circulate on all sides." The Armarkat Pet Bed Mat is perfect for young, playful dogs who might not need the orthopedic support just yet. Instead, the durable bed is made from a heavy duty canvas (to withstand chewers) and has a skid-free base so it can stay in one place, even as your pup jumps on and off. The cover is a soft plush and zippers off for machine washing. The bed also has a waterproof lining for extra cleanliness. Sizes include medium (28" x 22" x 5"), large (39" x 28" x 7"), and extra large (39" x 35" x 8"). As your dog’s fur slowly starts turning gray, you may need to invest in a more supportive dog bed that provides them with relief from common conditions. Boasting over 3,000 five-star reviews online, the Big Barker 7” Pillow Top Orthopedic Dog Bed is the cream of the crop when it comes to orthopedic beds. Specially designed for larger breeds, the Big Barker is crafted with three layers of plush, therapeutic foam and a 100% microfiber cloth that won’t flatten with use (as is the case with many orthopedic dog beds). This high-quality, machine-washable bedding is handmade by a small California-based company that specializes in supportive, durable beds for dogs with joint pain, arthritis, or other types of chronic pain. The Big Barker is undoubtedly one of the most popular beds of its kind, with thousands of pet owners singing its praises in the form of ecstatic online reviews. 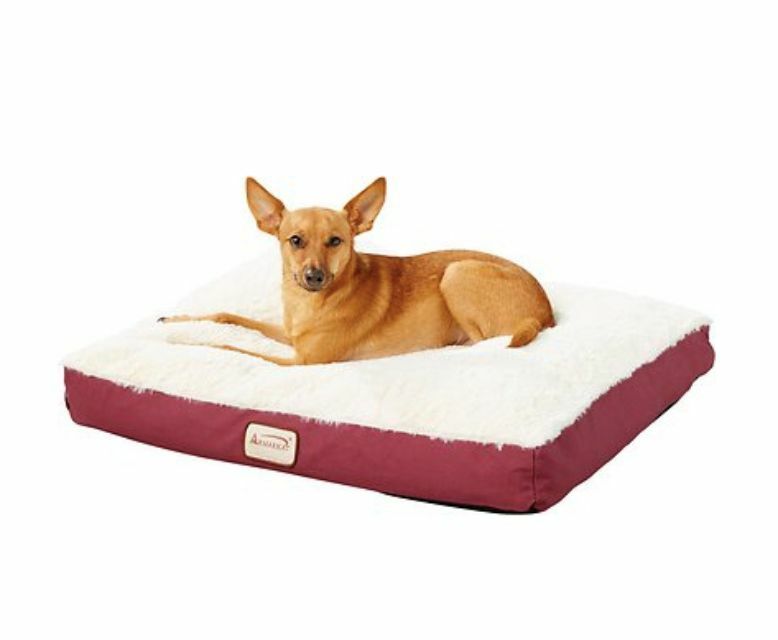 For additional options, take a peek at some of the other best orthopedic dog beds you can buy. For bigger dogs, choose the large or extra-large Bagel Dog Bed by Majestic Pet. It’s premium high-loft fill is ideal for pups that like to scrunch and nestle their way into bed. Choose the large for dogs from 45 to 70 pounds (surface area of 30" x 18" with a 9" bolster). The extra-large bed is perfect for 70 to 100 pounds, and has a surface area of 40" x 20" inches with an 11" bolster. The base is made from a durable and waterproof fabric and is fully machine washable. Sizes include 24", 31", 40", and 52". And colors include black, blue, green, khaki, red and burgundy. If you really want to spoil your four-legged friend, opt for a bed with high density memory foam, like the Pet Fusion Ultimate Pet Bed, which offers an extra level of comfort for dogs with joint pain and other forms of arthritis. The squishy bed has 4" of solid memory foam, plus bolsters for added support or a headrest when sleeping and relaxing. The removable cover is machine washable, but it is also water and tear resistant, in case of accidents or a rambunctious pup. The bottom has a non-skid surface so it won’t slide all around the floor. Sizes include small (25" x 20" by 5.5" inches with a 2" memory foam base), large (36" x 28" by 9" with a 4" memory foam base), extra large (44" x 34" x 10" with a 4"), and jumbo (50" x 40" x 13" with a 9"). Colors include brown and gray. A solid choice for all breeds and ages of dogs, the Midwest Deluxe Bolster Pet Bed is ideal for in-home use or to line the base of a crate. The bed has a soft, synthetic fleece cover and a padded base and a complete bolster to rest a tired head. The bed is completely machine washable and dryer friendly, but won’t stand-up to dogs that chew. Sizes include 18", 22", 24", 30", 36", 42", 48", and 54". Colors include brown, gray, pink, blue, and white. For dogs who are 25 pounds or smaller, the Deep Dish Cuddler by Best Friends by Sheri will keep your small friend warm and snug. The supportive bed is designed like a bowl, so that the back is higher than the front and the entire surface area lets your pooch nestle in for a deep night’s sleep. The bed is 20" in diameter, with a 9" front and a 12" back. Cover options include a fuzzy Sherpa fabric or a microplush fabric. The bed is safe for machine washing and drying. Colors include a variety of neutrals, as well as pink and teal. Perfect for older pooches or dogs that live in hot climates, the Coolaroo Elevated Pet Bed by Gale Specific is a supportive bed that gets your pets off the floor. The design of the elevated bed (8" from the ground) allows for air to circulate on all sides. Plus, a raised bed helps eliminate hot spots or pressure points—ideal for dogs with arthritis or touchy hips who often can’t get comfortable on a regular bed or pillow. It’s easy to put together with a lightweight, steel frame, and the platform is flea, mite, mold and mildew resistant, so even a wet pup won’t wear this bed down. The portable bed is easy to wash and comes in gray, green, orange, and tan. Sizes include small (35" x 22" x 8 "), medium (42" x 25.5" x 8"), and large (51" x 31.5" x 8"). Still can't decide on what you want? 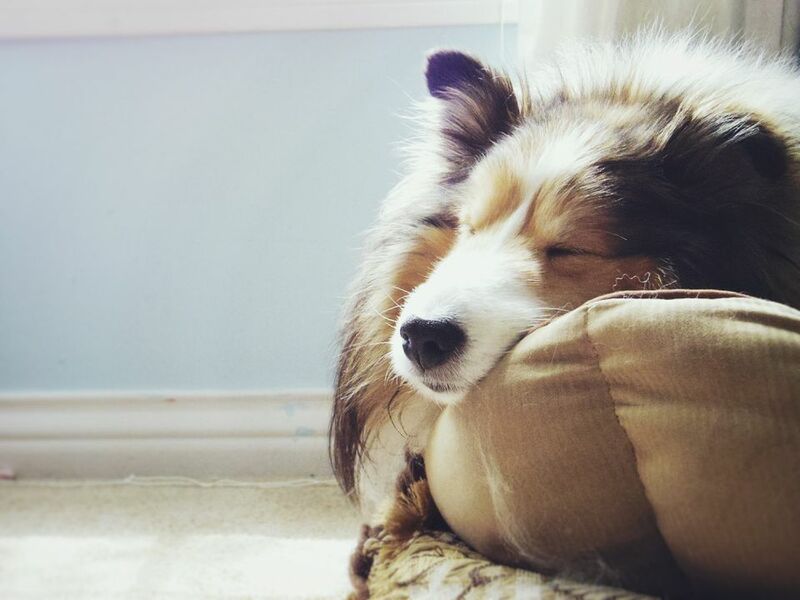 Take a look at our round-up of the best cooling dog beds.